alaTest has collected and analyzed 418 reviews of Aiptek AIPTEK3D IH3. The average rating for this product is 3.6/5, compared to an average rating of 4.0/5 for other Camcorders for all reviews. Reviews about the size and portability are generally positive. The image quality and usability are also mentioned favorably. Opinions are divided on the reliability. There are some negative opinions about the color and zoom. We analyzed user and expert ratings, product age and more factors. 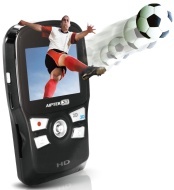 Compared to other Camcorders the Aiptek AIPTEK3D IH3 is awarded an overall alaScore™ of 82/100 = Very good quality. alaTest has collected and analyzed 6 user reviews of Aiptek AIPTEK3D IH3 from Amazon.co.uk. The average user rating for this product is 3.2/5, compared to an average user rating of 4.0/5 for other Camcorders on Amazon.co.uk. People are impressed by the battery. The portability also gets good opinions. alaTest has collected and analyzed 315 user reviews of Aiptek AIPTEK3D IH3 from Amazon.com. The average user rating for this product is 3.5/5, compared to an average user rating of 3.9/5 for other Camcorders on Amazon.com. Reviews about the size and portability are overall positive. The image quality and usability also get good opinions, but there are some mixed reviews about the reliability. Some have doubts about the color and zoom. Aiptek beats the big names with our first taste of shooting video in 3D. Some of the pocket camcorders can also take still images. This unit from Aiptek can take still and movies in 2D and it can also do the same in 3D. It has built in software to allow an interface on the PC, all fine in theory. Mine was purchased refurbished, it was probably returned due to the low battery warning problem. Quality 720p (sans any zoom) recording. 8MP still camera. Menu system is a no brainer after a minute or two of playing around with it. Lightweight. Very adjustable view screen. I hate putting cons here because what can you expect for a great price? So: No optical zoom (understandable, it's a inexpensive camera). MOV (quicktime) output. Uhg, why could they not support mpeg1/2 or wmv or avi? Buy yourself a high quality digital cam or a different video camera. This thing is a joke. I don't know why anyone gave it a rating higher then 1. They must not have an average digital cam. Very poor video quality. My Cannon powershot takes better audio and video then this thing does. HD what?. Comes in a plastic package. New egg better accept a return on this piece of junk. Try to avoid taking stills,use a true digital or not digital camera. neweggs great never had to return a thing......if you want a cam for around the house to catch the crazy,funny or cute stuff pets and kids do then this is the camcorder for you. not a bad price....video quality isnt bad......its a small camcorder light....long battery life......fast charging battery. if i could say one thing about this it would have to be......take the HD off of it....nowhere near......just because it records at HD resolution dont make it HD.....one other thing is that they should include a carry case. Unfortunately, the zoom is digital, so HD quality is gone when zooming in. Other reviewers have mentioned the audio quality is poor, and I would have to agree. But you can't expect a cheap camera to be as good as a professional one. I bought this to film my kids as they play sports; tee ball, motocross, and other events. It's not the greatest camera and image stabilization would be a huge bonus, but for the price it will suffice until I can afford an $800 Hi-Def camera. Not really HI-Def. If you accidentally use the "Macro" slide anything past 10 feet is severely blurred. Zooming in or out will likely cause video lag.